Which antibodies for zebrafish are the most used? As the vast majority of commercial antibodies are raised against human proteins, we became interested in taking a look at which commercial antibodies are being used by the zebrafish research community. Is the zebrafish research community using a subset of specialist antibodies raised for zebrafish research, or is it relying on anti-human antibodies cross reacting? Zebrafish are a common and useful scientific model organism for research studies. 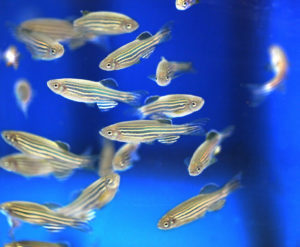 Their use as a laboratory animal was pioneered by the American molecular biologist George Streisinger and his colleagues at the University of Oregon in the 1970s and 1980s – today zebrafish are employed in many research disciplines, ranging from developmental biology to cancer research or neuroscience. Our team has looked at CiteAb’s citation data for research that has used zebrafish in antibody experiments, and extracted details for the most cited, who these were supplied by and what species of protein they were raised against. Dr Chalmers, founder of CiteAb, said: “Looking at CiteAb’s data, we found several hundred individual antibodies with citations for use in zebrafish research. “Interestingly we find that almost all of the most frequently used by the zebrafish community are antibodies that are raised against human (or other mammalian) proteins that happen to successfully cross react. In addition to the many antibodies that will cross react, there are a small number of antibodies available that have been raised specifically to target zebrafish proteins. Examples include zpr-1 which is raised against zebrafish proteins and is commonly used to label photoreceptors. This antibody is supplied by the not-for-profit zebrafish International Resource Centre (ZIRC). Dr Chalmers added: “While we do see a small number of specifically raised antibodies, these are the exception rather than the rule, with most zebrafish research using antibodies raised against human proteins. “This means that the zebrafish research community is dependent on human antibodies cross-reacting, limiting the number of available reagents and potentially limiting research progress. You can sign up below to see the top 10 antibodies used in zebrafish research, or if you would like to see a full dataset of all antibodies cited for zebrafish research then contact us and we’ll discuss options with you.